Google is set to announce the upcoming Google Pixel 3 and Google Pixel 3 XL in the coming months, today we got a major leak. 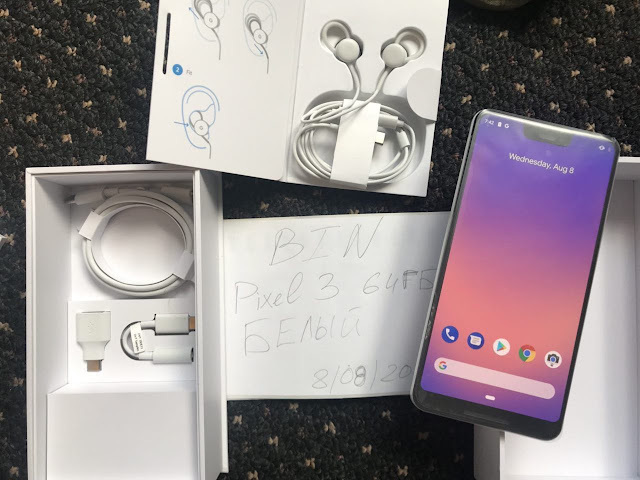 The leak shows the phone, retail box, Pixel Buds like USB-C headphones, and charger. The leak comes from a Russian Telegram channel, the photo shows the white variant of the Google Pixel 3 XL. Compared to the first two Pixel devices, the separation of the glass on the phone’s rear is almost invisible. Google's single camera lens is still a go, just like the existing Google Pixel and Google Pixel 2 devices including the fingerprint reader and Google logo at the bottom. The leaked photos and video shows the phone fully booted with a shot of the settings revealing the “Google Pixel 3 XL” model name and even the device’s serial number (not a good move leaker... lol). The “Hardware version” in settings is listed as “DVT1.0.” which stands for Design Validation Test and is usually a revision prior to final production. The leaked device looks to be running Android 9 Pie, the device has successfully gone through the initial Pixel Setup process. Gesture navigation is on, and said to be enabled by default on the Google Pixel 3 devices. A hardware specifications app confirms the Qualcomm Snapdragon 845 processor, 4GB of RAM, and 1440 x 2960 display with a 494 PPI. The SIM card slot is located at the bottom left of the phone next to the USB-C port. Including in the box are Pixel Bud style headphones with the same rounded bud design and adjustable ear inserts as the current Google Pixel Buds, and have ditched Bluetooth in favor of a USB-C port.